How to Organize a Cooperative? “Cooperation” implies to act or to work together among people for whatever lawful activities. This is an ordinary meaning of cooperation. “Cooperative”, according to the Cooperative Societies Act, B.E. 2542, means a group of persons who jointly conduct affairs for socio-economic interests on the basis of self-help and mutual assistance, and are registered under the Act. So, we organize cooperatives for solving common pressing problems we, each, cannot solve separately. Or they are organized to serve the interests of their members in earning their living much more advantageous than they act individually. A cooperative can be in existence only by being registered by the Registrar, or Deputy- Registrar of Cooperatives who is authorized by the Registrar is accordance with the Cooperative Societies Act. After being registered, a cooperative becomes a “juristic person”. Being non-government organizations, cooperatives are legal persons in the private sector. A cooperative is an association of persons facing the same or common problems, who accordingly and automatically better know the problems than others. Therefore, the best problem solution is to unite those who have the common problems themselves to come together in unison to solve them. Being recognized by legislation, a cooperative is legal entity and an independent organization. Government gives support only when necessary. The Cooperatives adopt fair methods of sharing , among their members, the economic results arising from their operations. 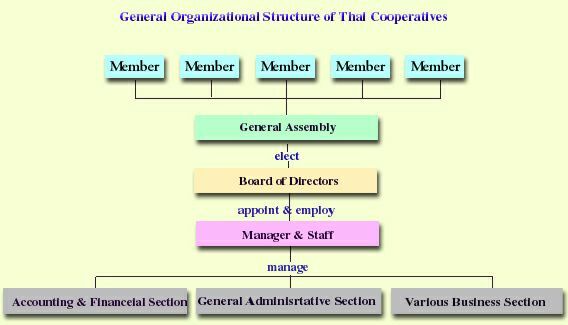 This is unique of the cooperatives that the members are co-owners. Cooperatives are based on the values of self-help, self-responsibility,democracy, equity and solidarity. In the tradition of their founders, cooperative members believe in the ethical values of honesty, openness, social responsibility and caring for others. 1. Cooperative grouping improves a bargaining power of the groups both in the purchasing and marketing of goods and services produced or needed by members of the groups. 2. It generates solidarity and brotherhood in a community, which brings about prosperity and progress to the nation. Cooperatives encourage their members to live peacefully. They promote the less privileged persons without destroying the rich. Cooperation implies peace or peace-oriented. 3. Credit cooperatives can provide their members with loan funds to invest in their enterprises or to spend on necessities. 4. Agricultural cooperatives enhance the members to learn agricultural technique, e.g. to improve productivity with modern agricultural practices, to sell their produce at better prices. 5. Cooperatives encourage equality among members in voting and expressing their opinion in the general meetings of the cooperatives. 6. Cooperatives provide their members with education and training to gain more knowledge and experiences, and with production loans together with the control of loan spending, joint buying of supplies and joint selling of produce. Cooperatives enable improvement of better living condition in the community. The main objective in organizing a cooperative is to unite a concerted effort of the people to solve the problems in life they cannot solve individually. A cooperative upholds the principle of voluntariness of the persons who join the cooperative. They enjoy equal rights in the operations of the cooperative, and share all the benefits derived from them. As a cooperative is a business organization with specific characteristics, it has to strictly follow, in its operations , the following seven principles accepted universally as the Cooperative Principles, i.e. to carry on all other affairs in connection with, or relating to the fulfillment of the objectives of the cooperatives. A cooperative is based on democracy . All cooperative members are its owners; but not all of them can administer a cooperative. Therefore, they have to elect, among themselves, a board of directors to carry on the administration on their behalf. According to the Cooperatives Act, B.E. 2542, a board of directors comprises not more than 15 directors, being authorized to execute all the affairs and representing the cooperative for the affairs related to the third parties. In order for a cooperative to carry on its affairs extensively and serve all or most of all its members, the board of directors employs a manager to carry out businesses of the cooperative. The manager, in turn, employs and supervises the cooperative employees to perform the day-to-day operations of the cooperative on the basis of an appropriate volume of businesses and economy. A cooperative is exempted from the payment of fees for the acquisition,disposal, defence or retention of ownership of an immovable property. A cooperative is not bound to pay income tax for juristic persons. Certain kinds of documents done by a cooperative are exempted from stamp duties. 1. Knowledge and Understanding of the Members on Cooperative Principles As a cooperative is an association of persons, these persons must understand the purpose of association, realize their rights and duties including cooperative principles and practices; so that its operations can be carried on smoothly, soundly and actively in giving its members the benefits according to its purposes. The cooperative organizers, therefore, need education on these aforesaid matters. 2. Operating Capital Operating capital can be derived from shares, deposits, loans, donations and accumulated surpluses. The cooperative organizers should assess how much capital and from where should be needed. If not sufficient, additions should be raised by which ways? 3. Sufficient Volume of Business A cooperative has to bear operating cost. Some are fixed cost which are not variable with the volume of business, e.g. salaries, depreciations, etc. Therefore, the cooperative has to gain much enough volume of business, so as to have income covering its cost. The organizers have to consider what kinds of business and how much of its volume they are going to undertake, and launch a campaign to encourage the members to do business with the cooperative as much as possible. 4. Manager of Cooperative A cooperative has to run a business, so it employs a manager to be responsible for operating and controlling closely the affairs of the cooperative. He must work fulltime and have experiences in the business concerned. He must also be honest, diligent and knowledgeable well on the cooperative principles and practices. The organizers, Therefore, have to deliberately select a suitable person to be a manager of the cooperative. 5. Needs of Persons to Unite in a Cooperative If persons want to form a cooperative for solving the common problems that they cannot individually solve them, the cooperative will be successful it is really organized from the common needs of its members. A right of cooperative members is the power they can act within the limit of the laws including the cooperative law, rules, regulations and the by-laws of the cooperative. 1. Members can attend a general meeting of the cooperative in order to express their opinions and desires or wants. They can also ask questions, propose ideas and recommendations, and vote under the principle of “one man, one vote”. However, a proxy vote is not allowed. 2. Members enjoy the right to elect a board of directors and the right to be elected as such in the general meeting. 3. Members can always inquire a director, a manager and employees of the cooperative over its performance, and can inspect documents and minutes of meetings of the cooperatives. It can see the importance of cooperative members for the success and failure of the cooperative, since they are both its co-owners and customers. Therefore they have to democratically control the cooperative and be interested in fully applying their rights of participating and supporting actively in the affairs and businesses of the cooperative with a sense of solidarity; so that the cooperative will be successful, otherwise it will finally fail. 7. to support the cooperative with loyalty and to encourage good persons to become members of the cooperative. The prosperity and progress of the cooperative in rendering services to the members, it can be seen, depends significantly on the roles played by the members. Therefore, they should exert their rights and perform their duties properly and actively. The organizing committee shall call the meeting of the prospective members to deliberate the draft by-laws and adopt them as the by-laws of the cooperative. four copies of the proposed by-laws. The Registrar of Cooperatives shall register a cooperative within 30 days from the date of receiving the application for registration, with no payment of any fee. the proposed by-laws of the cooperative are consistent with the model by-laws recommended by the provincial cooperative officer; they can be amended in the future. Department of the Agriculture and Cooperatives Ministry are Government agencies to promote, to support, to guide and to assist the cooperative of all types. How to Manage a Cooperative? After being registered by the Registrar of Cooperatives, a cooperative becomes a juristic person having a power of operations as prescribed in the cooperative law and its by-laws. It has a board of directors to administer its affairs and to be its representative in dealing with the third persons. The administration of a cooperative may be divided into two periods: the initial period and the permanent period. The organizing committee has the same powers and duties, and rights as the board of directors until the latter is elected in the first general meeting. Persons whose names appear in the name list of the prospective members will become members of the cooperative from the date of its registration. Within 90 days from the date of registration, the organizing committee has to call the first general meeting of members in order to elect a board of directors as prescribed in the by-laws of the cooperative. Consequently, the organizing committee must hand over all the works to the board of directors. After receiving the works from the organizing committee, the board of directors and the cooperative set to carry on its affairs and business until it is dissolved, if necessary.